Hawaiian rolls, stuffed with shaved ham and Gruyere cheese, basted in a delicious savory sauce, then baked to ooey gooey perfection! An easy, tasty, appetizer that's out of this world!! Cut all rolls in half. Place the bottoms only in a 9x13-inch pan. 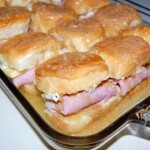 Place equal amounts of ham on each roll bottom. Top with Gruyere or Swiss cheese. On each of the roll tops, spread a generous amount of the cream cheese spread. Return the tops to the bottoms making sandwiches. In a separate bowl, mix together the melted butter, Worcestershire sauce, onion and Parmesan cheese. Pour over your sandwiches and let sit for at least 20 minutes. Preheat oven to 350 degrees. 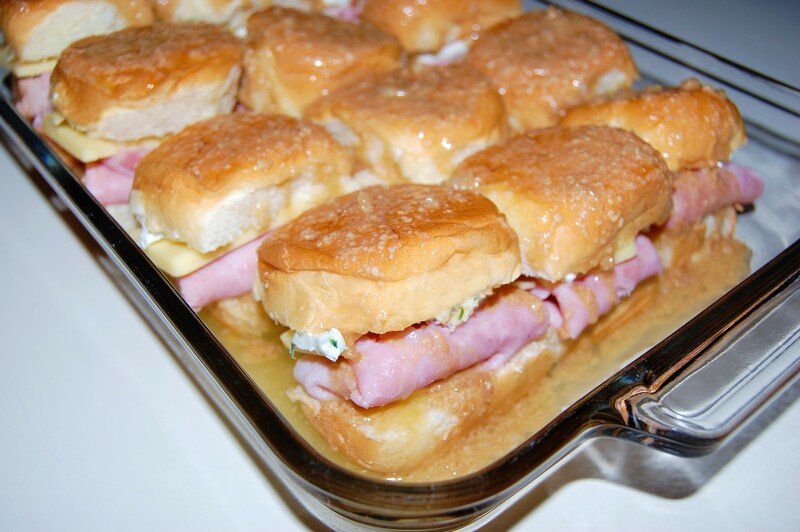 Cover sandwiches with foil and bake for 20-25 minutes or until warmed through. Enjoy! Cook's Note: You can make these sliders ahead of time, just cover with foil and place in the refrigerator until ready to bake.